Go Conscious Earth - Save Rainforest and Provide Clean Water with GCEarth! Support the work of GCEarth today! Go Conscious Earth partners with indigenous communities to save lives and preserve large tracts of rainforest and wetlands in the Congo rainforest, the second largest rainforest in the world. Rainforests are the lungs of the earth, and their destruction is a leading cause of climate change. At GCEarth, we work within indigenous communities to preserve rainforest, ensuring better protection and conservation for the long-term. 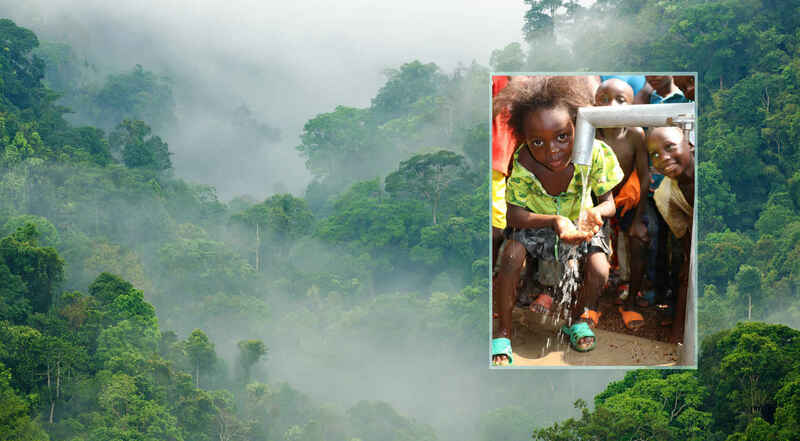 So far, we have saved one million acres of rainforest and provided clean water to over 22,000 people. It's easy to be worried about the state of the environment. Global warming, melting ice caps, and turbulent weather make us all wonder if we are doing enough to protect the earth for ourselves and future generations. We know the rainforests play a vital role in the earth's climate regulation, and we all want to protect them! There are large communities of people living in extreme poverty in these rainforests. When multinational companies take over these lands for logging or farming, not only do they destroy the rainforests, damaging the earth's environment, but they devastate the lives of the people living here, leaving them with even fewer resources for survival. Meanwhile, in their efforts to survive, these communities often use farming and fishing methods that further damage these ecosystems. Most of us have never lived without access to a school, water, or food. We haven't had to drink the water we wash our clothes in. We've never lost a child to starvation or a simple preventable infection. But for 790,000,000 people, these are the daily realities of their lives. At GCEarth, we have developed an approach that preserves large tracts of rainforest while fighting poverty and cultivating long-term sustainable practices within the communities living there. 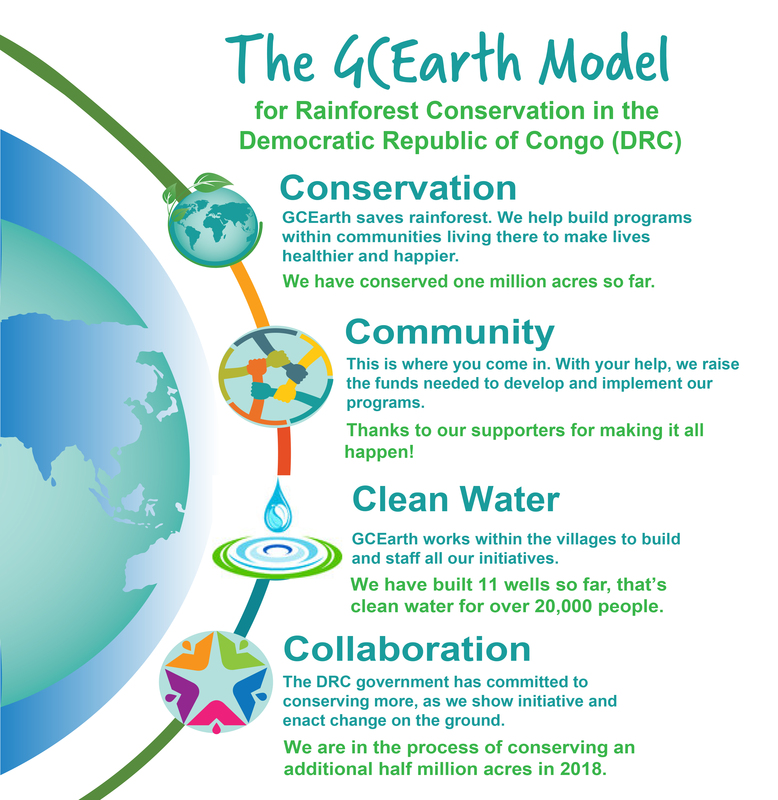 GCEarth has conserved one million acres of rainforest and provided clean water to over 20,000 people, so far! We have asked the communities there what they need and we are working with them to make that happen - simple projects that work. 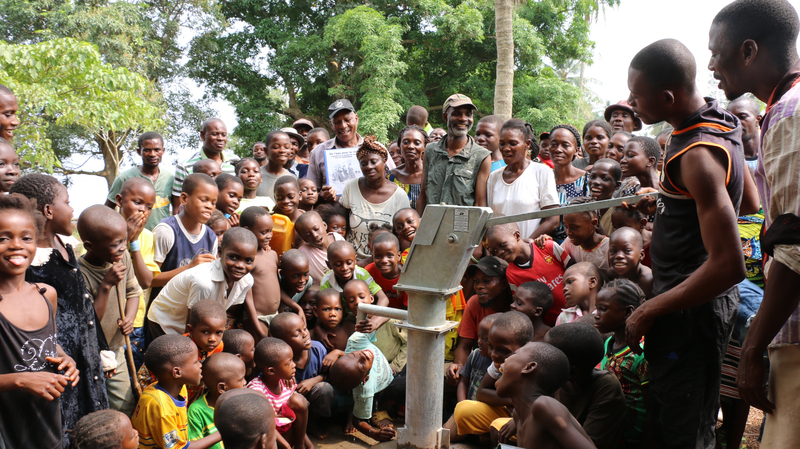 Freshwater wells, schools, health clinics, sustainable farming and fishing, and long-term income generation. And as we implement our anti-poverty initiatives, we continue to expand conservation area of rainforest and wetlands in the Congo Basin. Go Conscious Earth (GCEarth) is a 501(c)(3) U.S. non-profit organization. All donations are tax deductible to the extent allowed by law. We love that you care so much about the people who live in the forest and not just the forest itself! You do great work GCEarth. Love the work that you do!!! By saving wildlife, flora and indigenous peoples as a single community, you provide a model for saving the planet. Thank you and Happy Earth Day. I saw the preentation at the Orange-Chatham Group Sierra Club meeting and like the idea of the portable well drilling. Intelligence is not limited to the 1% or to those who drive cars, but intelligence without water dies. The Congo is a vital organ for the planet. Small steps add up toward real progress toward Earth-sustaining and People-enabling objectives. This donation is designated for the staff match. I pray for this small donation to grow exponentially through others giving as well. Blessings upon you all, workers and communities. Godar, can you say the alphabet backwards? 😁 I guess that isn't required for doing great work!! It's all honor to help GC Earth.